Good Morning! Here we are...Friday again! Boy this week went fast...this month has gone by fast...heck...this YEAR has gone by FAST! You know...there are only 94 days until Christmas!! Are you ready? I'm not! I need to get started on my cards!!! Well..I'm heading down the mountain to go to the Social Security office! My husband needs a replacement social security card so he can get his passport and I have to get my mom's 2016 tax form so her taxes can be done. It's so overwhelming to me all the things that have to be done to finalize an estate. There have been days when I just put it away and don't think about it. Anyways...I'm hoping things go smoothly and we'll get our grocery shopping done as well! The sunflower is made with the Eastern Medallion thinlits. Cut two, distress them with Early Espresso ink and layer them together with adhesive. I attached the sunflower to the Cherry Cobbler layer with dimensionals. The sentiment is stamped onto a small circle cut with the Stitched Shapes framelits. The leaves are punched with the Leaf Punch and the center of the sunflower is a 2" Early Espresso circle that is embossed with the Sweetheart embossing folder. The great thing about this card is it can be mailed with a standard stamp! 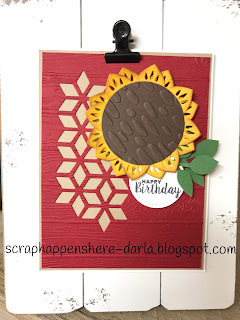 I LOVE the look of the sunflower with the Cherry Cobbler Pinewood Planks...it's very country! Have I told you lately, how much I LOVE sharing what I create with you!?!? Thanks BUNCHES for joining me each day and allowing me to INSPIRE you! Have a FABULOUS weekend!!! May you find just a moment to CREATE!! National Coffee Day...a day late!! Faux Metal Embossing Technique by Stampin' Up!